Kombucha is a fermented and mildly alcoholic brewed tea. For thousands of years, people have been making and consuming the drink for its many health benefits as well as its delicious taste. Somewhat recently, kombucha has become popular in Cape Town and many are willing to pay the hefty price tag often involved in buying it – but what about brewing it at home yourself for a fraction of the price? If your inner brewmaster is dying to give it a try, here are a few tips for getting started on making DIY kombucha. A SCOBY, or Symbiotic Culture Of Bacteria and Yeast, is the first thing you need to get started with your brewing process. You will also need a large jar (three to five litres) – tapped dispensers work well too – a stirring utensil of choice, a tight-weave cloth or paper coffee filter, and rubber/elastic bands. All of these things are most easily found in starter kits for brewing, which are the best things to purchase if you are new to DIY kombucha brewing. They also include lots of sugar to feed your baby SCOBY. We can highly recommend Faithful to Nature’s starter kit. If you get a different starter kit be sure to use the specific steps and measurements that come with your kit to ensure you make the correct amount. 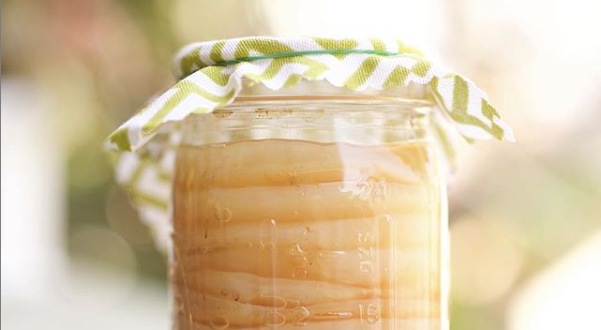 Mmm, nothing like pulling that brand new, juicy, healthy baby scoby out if a jar. 👶 Who agrees? Gather your ingredients and prepare to start brewing. In addition to the things in your starter kit, to get your brew going you will need bottled/purified water, white sugar, tea bags or loose tea, kombucha starter tea/distilled white vinegar, which will eventually all be mixed with the SCOBY. But first, combine hot water and sugar in your container (the water needs to be hot enough to steep tea but not boiling). Stir until the sugar dissolves and pop your tea in to steep. Let the mixture cool while the tea steeps; the longer you steep your tea, the stronger the flavour. Next, add your starter tea or distilled vinegar, followed by your active SCOBY. Now, cover your jar with either your coffee filter or fabric cloth and secure it with a rubber band. Allow your brew to sit undisturbed in temperatures of between 20-30°C. Keep out of direct sunlight for seven to 30 days or until you are satisfied with the taste, and remove for drinking. The longer you keep your brew, the less sweet and more vinegary it will become. Pour your kombucha from the top of your jar for enjoying and ensure you leave your SCOBY in enough liquid to survive for the next brew, you need roughly 10-15% of your first brew to restart the process successfully. The great thing about brewing kombucha is that your first SCOBY will produce a new baby SCOBY by the end of the brewing and fermenting process, allowing you to grow your collection and eventually make more kombucha. Your SCOBY needs to be at least 1cm thick before you consider separating it in its own jar. You can separately bottle your brew and add any flavours you like as long as you have separated your SCOBY from the brew and restarted the process again in the jar. Try adding different teas, citrus fruits or even edible flowers for taste and aesthetic; make your own unique flavours and have fun experimenting. – Metal tea strainers can be used for loose leaf teas but should be removed before the SCOBY is added. – Some teas are not good for your SCOBY; if you are using a different tea to infuse your brew that didn’t come with your starter kit, make sure you have a google to check how safe it is to use that tea. – The SCOBY is a very delicate culture – treat it with care. – Some brewers get a fright when they discover black growths forming near the top of the jar as their kombucha ferments, but this is normal and they are harmless. -Think ahead and get two jars so that you can easily restart your brewing process. Be sure to always restart your process in a newly clean jar. -Spring water is the best to use for the brewing process so if you live near a spring in the Mother City, you’re in luck. If you find yourself needing a little more guidance, check out www.kombuchahunter.com to get more brewing info, product suggestions and see other brewer’s stories. – It may help people manage type 2 diabetes by lowering blood sugar levels. Make sure you brew your kombucha properly in order to enjoy its health benefits.